The controls were erratic. Using the input test in the diagnostic menu I could see 3 buttons and the right direction were being activated together. A visual inspection quickly pinpointed the fault. 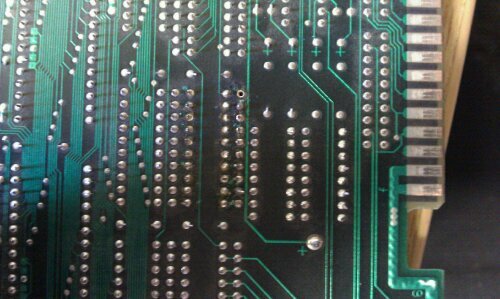 One of the input resistor banks was partially desoldered and cracked. Trying to remove the IC myself proved quite a task but removed the two parts and slotted in a 4.7k resistor array from a scrap board. Now the inputs work fine. Just need to find a sound board for it now.